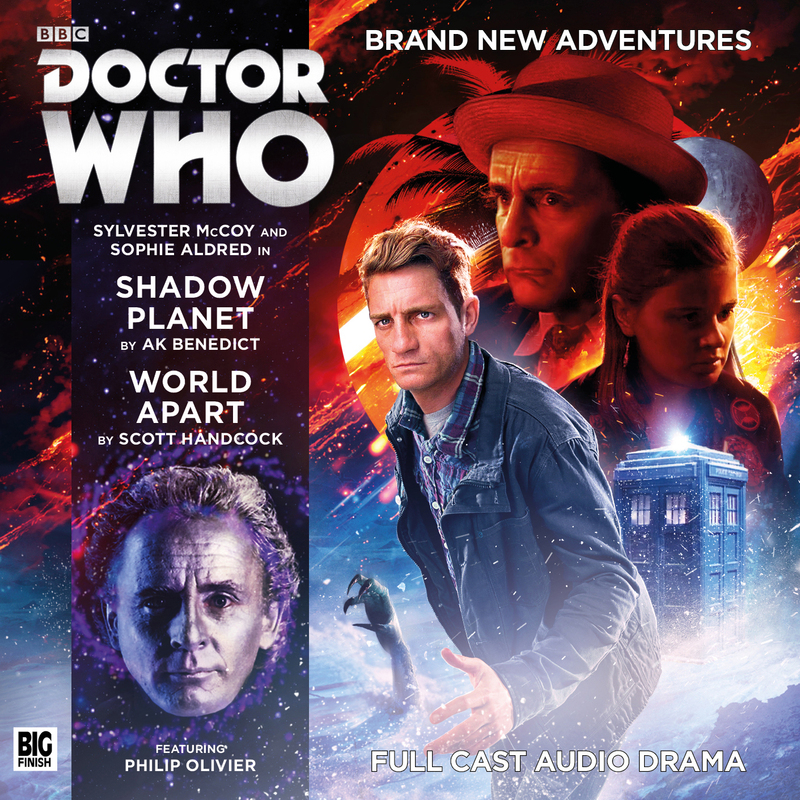 The 7th Doctor is the next to get the 2 one hour stories in one release treatment and they even resurrected Hex for the occasion! The Doctor for once lets Ace & Hex choose the destination. They pick the planet Unity. When they arrive they find a people who have learned the ability to separate their unwanted personality traits and download them into a robot body so they can face them and when they are done, they assimilate these parts of themselves to become whole again. But what happens when someone decides to remove parts of themselves and others and not give them back? This is a really enjoyable story. As someone who has worked in counselling & mental health for years I loved the psychological idea. I mean, Freud eat your heart out, right? I can’t say I didn’t see the idea of the removed personality not being re-integrated coming; but I’m guessing this wasn’t meant to be a big surprise. It’s more about what you do with that side of yourself you don’t like and how people can take advantage of something that was designed to help people. It’s always good to see Hex (Philip Oliver) back and it gives us a break from Seventh Doctor, Ace stories, as much as I enjoy them. Sylvester McCoy and Sophie Aldred have a lot of fun playing off him and it’s interesting to see the slightly different role Ace takes on when she is in more of an experienced role to Hex. We also get a good dose of the mind game playing 7th Doctor that he was only just on the route to playing on TV. Following on from the events of the Shadow Planet the Tardis finds itself drawn toward a large object in the vortex. This large object just so turns out to be a planet, a rather impossible planet called Nirvana, but is this planet here to stay? Ok, I know that isn’t a very full description, but this is one of those stories where over explaining the plot gives away a lot of spoilers. What I can tell you is this contains some nice moments between Hex and Ace and explores the time they had a bit of a ‘will they, won’t they’ vibe going on, this story gives a good back-drop to explore that further. Also following on from the last story Ace is put in a position where she has to be more Doctor like and reassure Hex, in a way that the Doctor might have once done for her. Like the Doctor she doesn’t always make it clear she is doing it. This really becomes interesting when she then deals with the Doctor and the consequences of his actions. My only slight negative on this story is it has a lot to do in one hour and this might have been a good one for a 2 hour treatment; as well as it fits in with the other story. Near the end I felt there were moments the characters were going back and forth between being angry and then talking through what happened more calmly in a way I wish they had more time to make this more smooth. But I do always say it’s better to have too much in a story than too little. These are both really well written, well performed & well directed stories (Director Ken Bentley). I also very much enjoy the musical feel created by Steve Foxon that took me right back to the 7th Doctors time. It’s nice to go have the 2 stories continue on from each other, draw a couple of parallels but feel like their own story. Big Finish also reminds us here that, whereas they usually go in their own order, or at least sets within a Tardis line up that continue on from each other, they can go into any point in their timeline or that of the TV show they want to and your just happy to have an old mate back such as Hex. I give this 8/10 sonic screwdrivers.